Whether you’re a homeowner, a business owner, or the manager of a large commercial facility, you’re probably aware that your floors take a lot of abuse on a daily basis. And it goes without saying that the better the state of your floors, the better an impression your space is likely to give on a whole. So if you need thorough, comprehensive tile, grout or stone cleaning service for your home or commercial property, call us to learn more about the options we offer. At A Step Above Cleaning Services, we go out of our way to exceed client expectations. When you hire us for your tile and grout cleaning, we’ll take the time to do our job diligently and accurately. As our customer, you can expect meticulous service and exceptional value, no matter the scope of the job. For more information about our tile, grout and stone cleaning services or to schedule an estimate, call today. We begin by applying a professional grade tile cleaning solution to your tile and grout. Then we scrub each grout line individually and let the solution dwell 5-10 minutes to loosen the deeply embedded soils. Next, using our truck mounted cleaning system, we rinse with at temperatures exceeding 200 degrees and up to 1000psi. This enclosed rinsing process immediately extracts the hot water and tile and grout cleaning solution along with all the dirt, grease and grime. Opting for sealing your natural stone or grout is a good idea. Especially in lighter grout, this helps protect it from greasy stains or soap scum buildup. 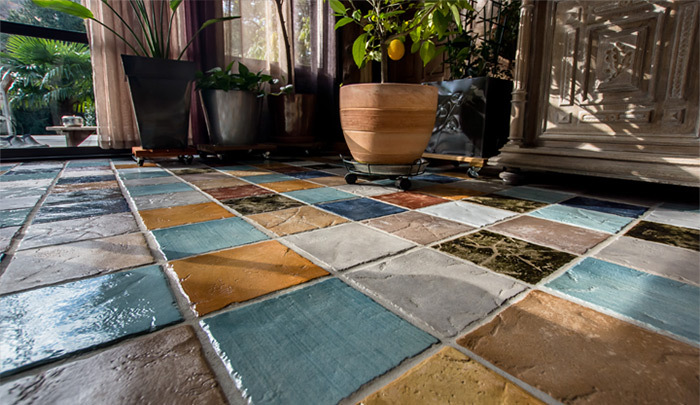 Natural stone and cement-based grout are porous, so it allows water to percolate inside leaving stains that may not come out without special treatment. Sealing natural stone & grout means that we apply a professional grade sealer and let it infiltrate the porous structure before the grease, moisture etc. can do this. Tile Cleaning: $.50/ sq ft.
Tile Restoration: $.75/ sq ft.
Tile Sealer: $.15/ sq ft. Call our cleaning company today to get started.